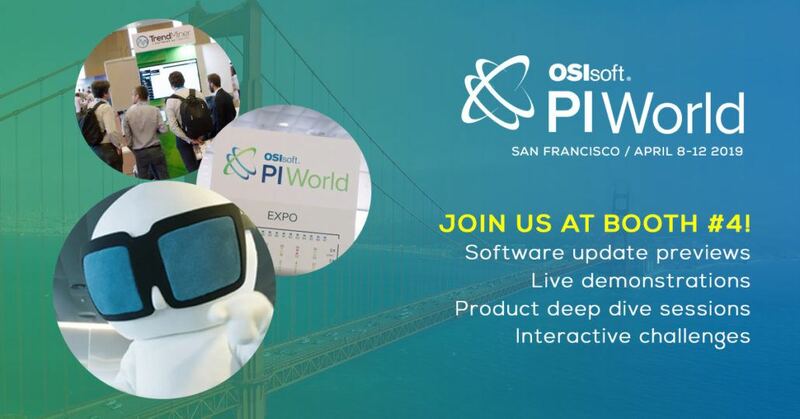 As a long-term OSIsoft partner we unveil extended capabilities to support PI Event Frames and a preview of our latest software enhancement, DashHub, at this flagship event. PI World is a global meeting place for everyone who works with OSIsoft PI. From new users to PI system administrators, from partners to executives, this is the OSIsoft event to attend. That’s why TrendMiner will be there as a Gold Sponsor. With 2800 attendees, PI World offers extensive networking opportunities and a wealth of information and shared experience. PI World is a large event, with 11 industry tracks, 2 exhibit halls and 80 training labs. Pre-conference events include the academic symposium, in Diversity & Inclusion forum and a range of evening events. Not only are we Gold Sponsors, but we’ll be onsite doing demos and giving a sneak peak of some of the functionalities that will be available in our upcoming software update. Come by booth #4 for quick glimpses, or join us for deep dives at 1:30 on Tuesday & Wednesday. Meet us at Booth #4 for a fun and interactive experience! Additionally, TrendMiner customer Deepwater Subsea’s CEO Mike Fry will be participating in the Upstream Oil & Gas Best Practices Panel on Wednesday, April 9th at 4pm. From live demos to interactive games at the booth (can you top the TrendMiner Test and save the day?) this event is one you won’t want to miss. Contact us today to schedule a 1-1 with our team! Additional agenda & event information is available on the OSIsoft website.